I thought he said to take it slowly?! 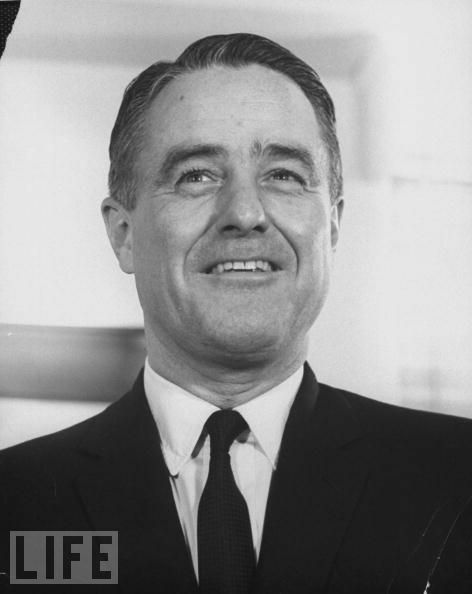 Sargent Shriver is shown in a Life photograph. The former vice presidential candidate was the godson of Baltimore Cardinal James Gibbons. 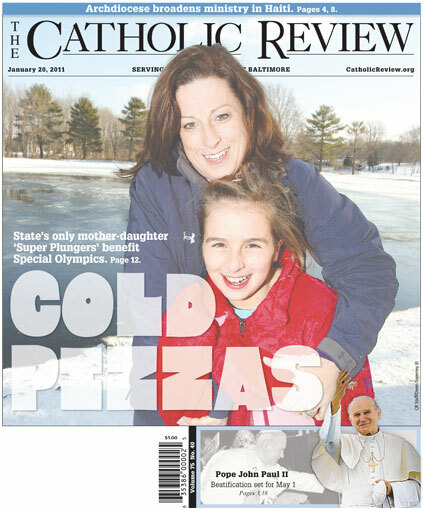 This week’s cover story in The Catholic Review spotlights a mother and daughter who are planning to jump into the icy Chesapeake Bay at the end of the month to raise money for the Special Olympics. Was it mere coincidence that the story went to press the same day R. Sargent Shriver, longtime Special Olympics advocate and the last pro-life Democrat nominated to a presidential ticket, died at age 95? Born in Westminster, Md., on Nov. 9, 1915, Shriver was baptised by legendary Baltimore Cardinal James Gibbons, a family friend who served as Shriver’s godfather. The internationally-known prelate was a frequent guest at the Shriver homestead in Union Mills, and his young godson often served as an altar boy when the cardinal celebrated private Masses in the family chapel. The Shrivers owned the B.F. Shriver Company, a canning corporation with about half a dozen factories in Carroll County. Young Sargent attended St. John School in Westminster for grades one through three. After his family moved to Baltimore in 1923 when his father took a banking job, Shriver transferred to the “old” Cathedral School in Baltimore for grades four through seven. He later went to the Canterbury School in New Milford, Conn.
Shriver later served as President Johnson’s ambassador to France when French President Charles de Gaulle was asserting his nation’s independence and “making it a tense time” for Franco-American relations, Shriver said. It was during that time when Ambassador Shriver and his wife, Eunice Kennedy Shriver, began a program benefiting French children with disabilities. “Eunice rolled up the rugs of the embassy and had handicapped children in playing games,” Shriver said. The former ambassador recalled that President de Gaulle’s wife, Yvonne, requested a meeting with Mrs. Shriver after learning of the program. Unknown to the Shrivers, the de Gaulles had a daughter with Down Syndrome. With the support of her husband, Eunice Kennedy Shriver founded the Special Olympics in 1968. Sargent Shriver would go on to work as chairman of the board emeritus for the Special Olympics and president of the Special Olympics Movement from 1984 – 1996. He also served the Special Olympics as chairman of the board of directors from 1990 – 2003. After returning to the United States in 1970, Shriver was tapped to be Sen. George McGovern’s vice presidential running mate in the 1972 contest with President Richard Nixon and Vice President Spiro T. Agnew of Maryland. The McGovern-Shriver ticket lost in a landslide. A daily Mass communicant and dedicated pro-life supporter, Shriver ran for president himself in the 1976 campaign at a time when some newspapers reported that he was against a constitutional amendment outlawing abortion. It’s a charge Shriver denied in his 1994 Catholic Review interview. “I am not against a constitutional amendment on abortion,” said Shriver. He added, however, that he didn’t think an amendment had a chance of passing. Shriver never forgot his Maryland ties. ﻿﻿He and his wife gave a life-size portrait of Cardinal James Gibbons to the Basilica of the National Shrine of the Assumption of the Blessed Virgin Mary in 1989. The painting had been in their private collection for years. Although Shriver will be buried next to his wife in Massachusetts, it seems he had at one time longed for a different option. In his Catholic Review interview, Shriver spoke of returning to his beloved Carroll County. He recalled visiting old Westminster friends like Eddie Weant, a lawyer who lived in the same house where he had been born. When Ricky Gervais signed off from his caustic performance at the recent Golden Globe Awards, God was among those he thanked. ” Thank you to God for making me an atheist,” the comedian quipped. On his new CNN show, Piers Morgan challenged his fellow Brit on the comment – arguing that the joke was “nearest the knuckle” for Americans who hold faith dear. Check out the conversation that followed between Morgan (a self-professed Catholic) and Gervais (a self-professed atheist). Here’s a very strange story out of Greece. A monk, along with two other people, was arrested at the Eleftherios Venizelos airport in Athens, Greece after security personnel discovered the remains of a human body in their luggage as they tried to board a flight to Cyprus. The remains of Eleni Vathiadou, a former nun, were stolen by the trio after a memorial service held by the woman’s family at a local cemetery on Sunday to mark four years since her death, reports the Cyprus Mail. “In my opinion this cleric should be punished; the situation is unacceptable, it is sacrilege,” says Cyprus’s Archbishop Chrysostomos. Police spokesman Michalis Katsounotos says, “Our compatriots claimed that they dug up the remains because they considered the deceased a saint,” reports the paper. Vathiadou had once been a nun at a Cypriot monastery and was never officially declared a saint by the Cypriot or Greek Orthodox Churches. 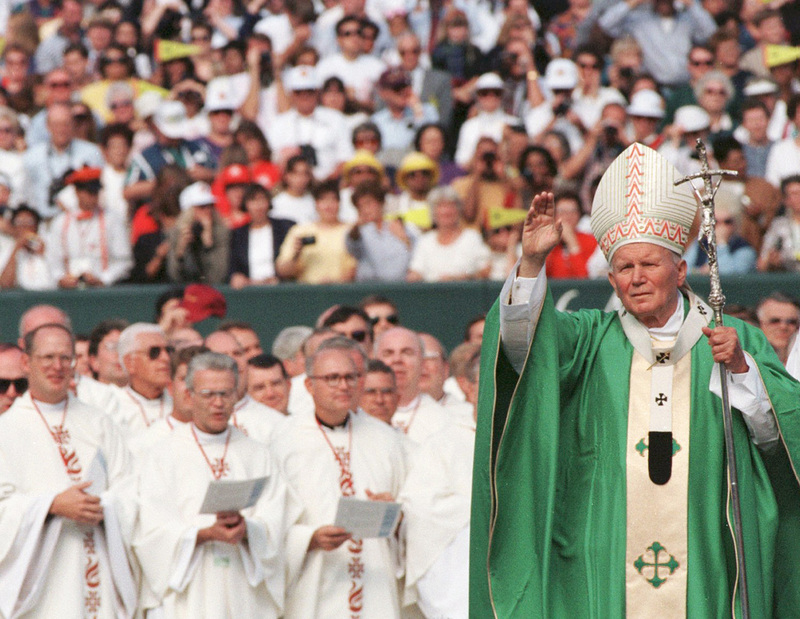 The recent announcement that Pope John Paul II will be beatified May 1 brought renewed attention to the late Polish pontiff’s intense prayer life and his almost mystic spirituality. But the pope also had a playful side. 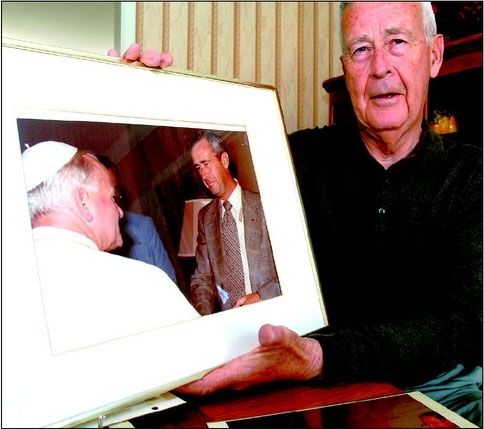 James Le Gette, a Secret Service agent assigned to help protect the pope during the Holy Father’s first visit to the United States in 1979, caught a glimpse of that playfulness firsthand. The parishioner of St. John in Severna Park was with the pope at St. Matthew’s Cathedral in downtown Washington, Oct. 7. Mr. Le Gette had positioned himself on the landing of a stairway leading down from the floor where the meal for the pope was held. “I turned back to see where he (the pope) was, because I was concerned about a tumble,” Mr. Le Gette said. “Ho, ho, ho, Secret Service,” Pope John Paul said. Mr. Le Gette looked at the rest of the papal party coming down the steps the old-fashioned way. Ursuline Sister Anne Michelle Mudd has devoted more than 50 years serving the King of Kings as a religious sister. At the same time, it seems the now-retired Catholic school teacher has also been a fan of another king: he of rhinestone jumpsuit fame. The Owensboro Messenger-Inquirer in Kentucky recently reported on Sister Anne Michelle’s love for Elvis Presley, expressed in an impressive collection of Elvis memorabilia that includes miniature Elvis cutouts, pillows and a thermometer. Sister Anne Michelle is a soft-spoken woman. She said people are sometimes surprised that she is such a devoted collector of Elvis memorabilia.Over the years, she has accumulated hundreds of items. Many of them were given to her by friends, family and students. “The students call my house the Elvis Museum,” she said. Elvis is even in the bathroom. The shower curtain is Jailhouse Rock Elvis in his striped shirt. Elvis’ last movie, Change of Habit, was released in 1969. He falls in love with a nun named Sister Michelle. 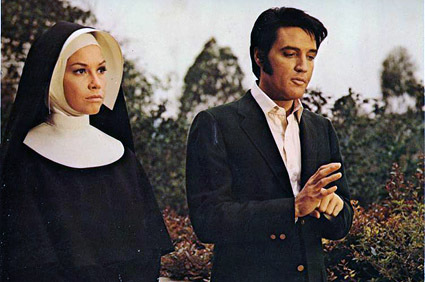 But the nun, played by Mary Tyler Moore, chooses her vocation over Elvis. “I would have done the same,” Sister Anne Michelle said when asked. John Paul II’s pontificate was an eloquent and clear sign, not only for Catholics, but also for world public opinion, for people of all colour and creed. The world’s reaction to his lifestyle, to the development of his apostolic mission, to the way he bore his suffering, to the decision to continue his Petrine mission to the end as willed by divine Providence, and finally, the reaction to his death, the popularity of the acclamation “Saint right now!” which someone made on the day of his funerals, all this has its solid foundation in the experience of having met with the person who was the Pope. The faithful have felt, have experienced that he is “God’s man”, who really sees the concrete steps and the mechanisms of contemporary world “in God”, in God’s perspective, with the eyes of a mystic who looks up to God only. He was clearly a man of prayer: so much so that it is from the dynamism of his personal union with God, from the permanent listening to what God wants to say in a concrete situation, that the whole of “Pope John Paul II’s activity” flowed. Click here for a full report on the beatification from Catholic News Service.